Shopping in Korea-Good, Bad or Fab? I'm back from my travels and am frantically trying to catch up on work, fight off jet lag, and wean myself off of the eclectic and deliciously carb-centric Asia diet. Thanks to our wonderful hosts, the trip was a seamless blend of my favorite pastimes-sightseeing, shopping, eating, and exploring. Of course, between the four, shopping definitely takes precedence. And I did plenty of it in Seoul! After all, there's really no escaping this pastime in a city that's compounded with boutiques, department stores and a 24-hour shopping city. No wonder the ladies of South Korea are truly some of the best dressed girls I've seen in the Eastern hemisphere. Even in the rain, an overwhelming majority of the girls wore feminine dresses coupled with dainty high heels. It's truly a skill to be able to dress so cute (and have the motivation to do so) under such strenuous weather conditions! Dongdaemun, aka Seoul's "shopping city." There are over 5,000 shops located in this district, selling various fabrics, materials, accessories, wedding products, and more. The fabric and clothing here are of the latest fashion trends in the world. Inventory is imported and exported in real time, making Dongdaemun a must-visit fashion market for everyone. Most of the stalls open in the late afternoon and do not close until the next morning. A lot of retailers from neighboring countries come here to purchase wholesale products for their shops. I came here around midnight and the place was absolutely bustling with shoppers, vendors and food stalls! Myeongdong is Seoul's busiest area teeming with tens of thousands of people at any given time. There are hundreds of shops here and you can find Korean cosmetics stores like The Face Shop, Etude House, and Skin Food as well as the Ralph Lauren-like Bean Pole. The shops are very mainstream and you can find both international brands (Adidas, Nike, Ralph Lauren Polo, Uniqlo, Zara, H&M, etc.) and local brands along with two huge department stores. 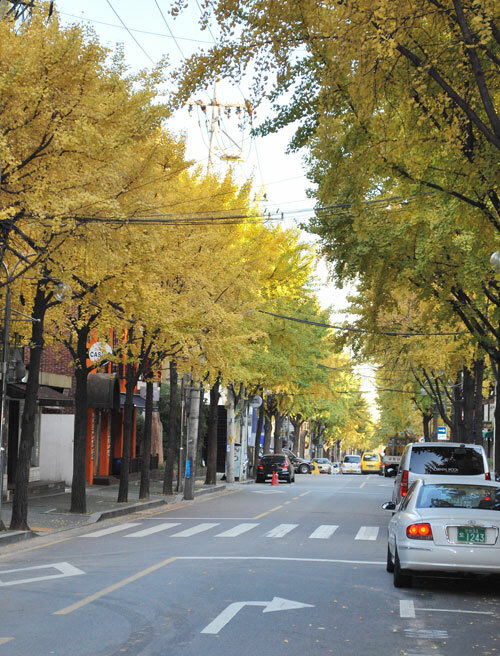 Garosougil translates to "tree-lined street" and yes, tons of trees line both sides of this Melrose/Robertson/K-pop fused promenade. This sophisticated, up-and-coming street is flanked with all sorts of trendy shops and European-style cafes. I absolutely love this street and found myself coming back time after time. The products carried in the shops are more upscale and high quality than those found in the other shopping areas. And yet, the prices were still quite reasonable. So, to answer my question above, shopping in Korea was pure fab. Very nice! That's soooo many ppl on the street! i've been to korea a few times before, and totally agree! Beautiful pictures, would love to go to Korea someday! My sister in law (who is have Korean) got me hooked to the food!